Puffy winter coats could pose danger for kids in car seats | Norton Children's Louisville, Ky.
As the temperatures continue to drop, many parents are making a potentially fatal mistake by putting their kids in winter coats while they are in car seats. 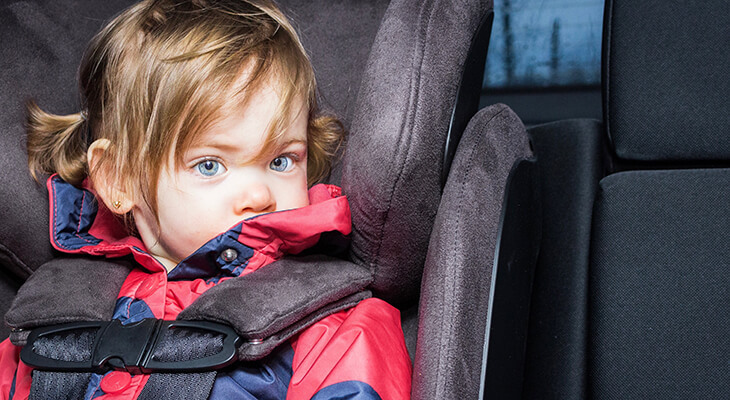 When a child is wearing a winter coat, it may feel like they are strapped snugly into the car seat, but the straps actually are dangerously loose against the squishy coat. Kinzie Evrard, a child safety seat expert with Norton Children’s Prevention & Wellness, which is funded through the Children’s Hospital Foundation, said the coat keeps the child from being restrained in the event of a crash. Instead, Kinzie suggests taking off the winter coat before putting the child in the car seat. She recommends either keeping a blanket handy in the car or laying the jacket over the child once the child is in the car seat. Put the coat on your child; sit the child in the car seat and fasten the harness. Tighten the harness at the child’s shoulders until you can no longer pinch any of the harness webbing with your thumb and forefinger. Without loosening the harness, remove your child from the seat. Remove the coat; put your child back in the seat and buckle the harness straps, which are still adjusted as they were with the coat.